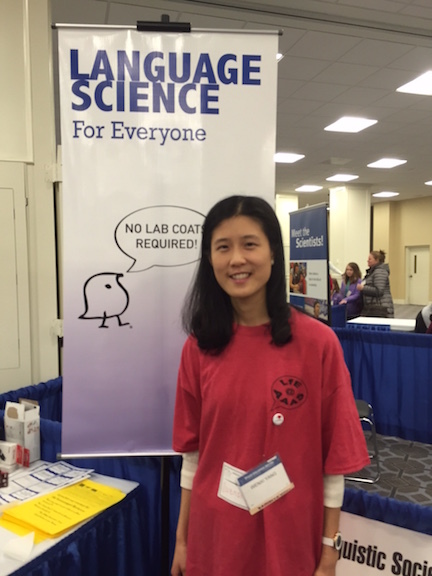 The Language Pod participated in the AAAS Family Science Days in Washington, D.C. on February 13 and 14. Professors, graduate students, and undergrads demonstrated tools and methods of linguistic research at the Linguistic Society of America booth, sponsored by the NSF. 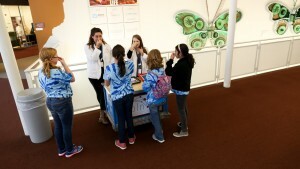 Family Science Days is a free two-day science showcase featuring hands-on demos, shows, talks by scientists, and other family-appropriate activities, a great part of the annual meeting of the American Association for the Advancement of Science (AAAS). Pictured here is Wenxi Yang, who took the Language Pod course with me in 2013 and is now a graduate student in Georgetown University’s Language and Communication program. The Language Pod course EDUTL/LING/PSYC 5700 Training in Informal Science Outreach is featured in OnCampus. I am teaching it this semester and having a great time teaching at COSI and in one of OSU’s Innovative Spaces on campus.